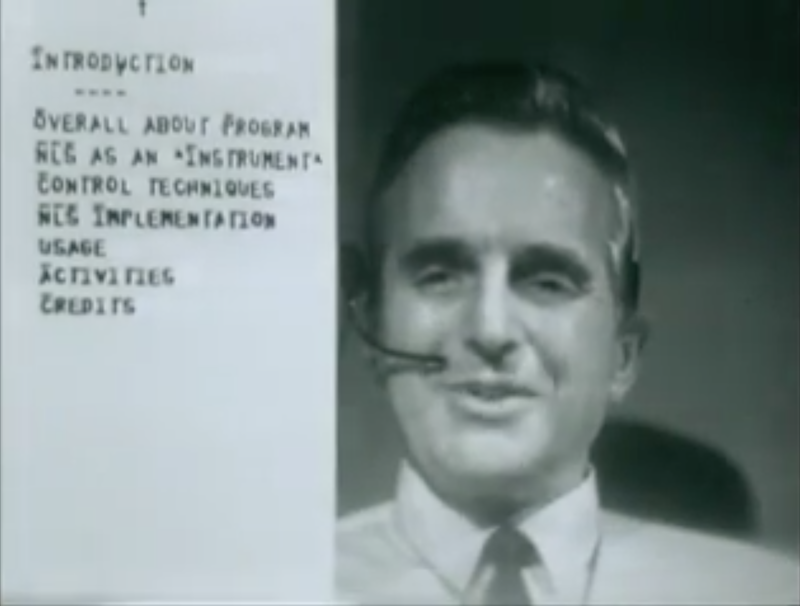 Now celebrating the 50th Anniversary of Doug Engelbart's landmark Demo! Visit theDEMOat50.org for details. Welcome to theDemo.org – our main portal into Doug's great demo of 1968 where you will find stories, archive footage and photos, and links to other fabulous resources at Stanford Libraries Special Collections, SRI International, Computer History Museum and more. Experience the demo, and watch retrospectives by Doug and his team recounting their experience. Now a 'milestone event' in the history of computing! 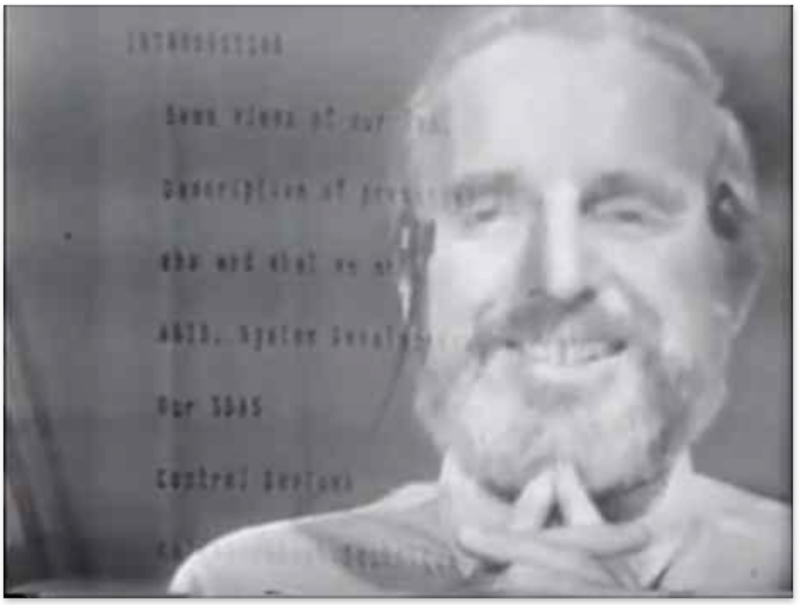 On December 9th, 1968 Doug Engelbart appeared on stage at the Fall Joint Computer Conference in San Francisco's Civic Auditorium to give his slated presentation, titled "A Research Center for Augmenting Human Intellect." He and his team spent the next 90 minutes not only telling about their work, but demonstrating it live to a spellbound audience that filled the hall. Instead of standing at a podium, Doug was seated at a custom designed console, where he drove the presentation through their NLS computer residing 30 miles away in his research lab at Stanford Research Institute (SRI), onto a large projection screen overhead, flipping seamlessly between his presentation outline and live demo of features, while members of his research lab video teleconferenced in from SRI in shared screen mode to demonstrate more of the system. 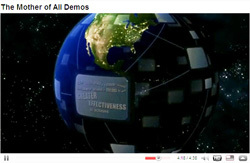 This seminal demonstration came to be known as "The Mother of All Demos." 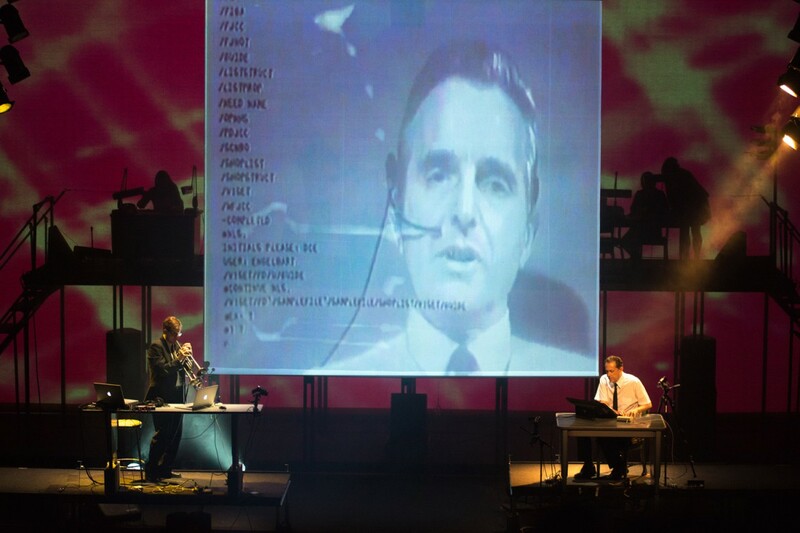 What you are about to see - watch futurist Paul Saffo que up the demo for a live audience at the 30th anniversary event titled "Engelbart's Unfinished Revolution" (more below). Highlights Version (24 minutes in 10 clips, nicely done!) just the highlights, from SRI International, birthplace of the demo. Or watch selected highlights. NEW! Interactive Version (100 minutes, chapterized) a navigable, skimmable, browsable guided tour of the demo puts you in the driver's seat (learn more). Annotated Version (100 minutes, 35 parts, excellently annotated!) a detailed guided tour of the demo at the Stanford MouseSite. Complete 1968 Demo (100 minutes, hi res, in 3 parts) watch from start to finish, courtesy of Stanford Mousesite, now archived at the Internet Archive. See SRI's Timeline on Innovation: Computer Mouse and Interactive Computing with concise background and overall significance of the demo. Browse the virtual exhibits showcasing Doug's work at the Computer History Museum. Explore the MouseSite at Stanford for stories, archive video, photos, and key technical papers from the Douglas C. Engelbart Collection at Stanford Libraries Special Collections. NEW! Learn about Doug's collaboration with Herman-Miller Research, pioneers of the office of the future, who produced the custom swivel console and Eames chair used in the demo. Read the paper: This "Mother of all Demos" was technically a computer-supported talk presenting their work, also documented in their submitted paper titled A Research Center for Augmenting Human Intellect, which was published in the Proceedings of the 1968 Fall Joint Computer Conference. See also the 1968 Demo Table of Contents which links to specific sections of the Demo, the Detailed Onscreen Outline used as 'slides' during the Demo, and a full draft transcript of the demo. 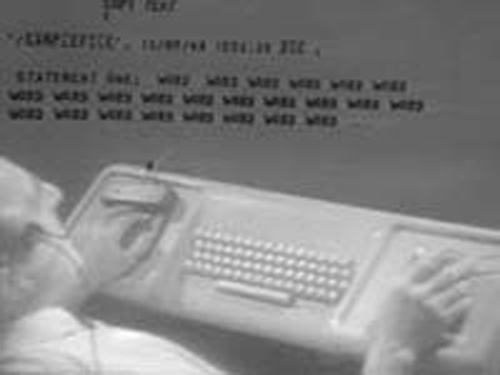 Watch Doug's 1986 presentation and accompanying paper Workstation History and The Augmented Knowledge Workshop in the conference proceedings, telling the story of his 1968 demo, the work surrounding it, and the vision it represented, with historic photos and personal anecdotes woven throughout. Doug is introduced by Charles Irby, who joined his team in 1968 after seeing the demo live at the conference in San Francisco. Two fabulous anniversary events were later held to commemorate the demo, with panel discussions by Doug, members of his research team who participated in the 1968 demo, and invited guests discussing what it took to put on the demo that day, what it was like behind the scenes, and the significance of the work they were doing then and now. 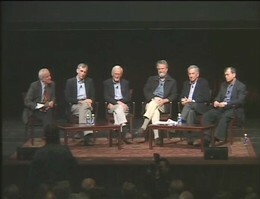 Watch the 1998 Panel Discussion with (left to right) moderator Paul Saffo, Doug Engelbart, members of his research team Bill English, Charles Irby, and Jeff Rulifson, plus special guest Stuart Brand. CONTENTS: Welcome by Paul | Demo Footage (15min) | Back to Paul | Introducing Panelists | Panel Discussion. Contemplating the event's title "The Unfinished Revolution," futurist Paul Saffo remarked: "because the extraordinary thing is, even with the events that were demonstrated 30 years ago, more remains unfinished than has been completed." Visit the 30th Anniversary event website for more about the event and to watch more sessions. Watch the 2008 Panel Discusssion [Part 1 | Part 2] with members of Doug's research team Jeff Rulifson, Bill English, Don Andrews, Bill Paxton, together with special guest Andy van Dam and moderator Bob Sproull discussing the demo and its significance. Watch the Stanford News Report on the Event (3 min. video) - an excellent compilation. Visit the 40th Anniversary event website for more about the event and to watch more sessions. Visit MouseSite - the definitive website on the 1968 Demo (as well as the history of the Mouse) hosted by Stanford University. "The Mother of All Demos" (90 min Video/Film) Doug's 1968 debut of NLS (Augment's precursor) including hypermedia, the mouse, collaborative work, interactive computing, human computer interface, and overarching guiding principles. See especially Clip 12 where Doug, sitting in San Francisco, brings in a coworker sitting in his lab in Menlo Park, to demonstrate the mouse, and Clip 13 where Doug introduces the keyset. A Research Center for Augmenting Human Intellect. (the paper written for the conference where they gave the demo, describing the work they were demoing). Douglas C. Engelbart and William K. English, AFIPS Conference Proceedings of the 1968 Fall Joint Computer Conference, San Francisco, CA, 33, December 1968, pp. 395-410 (AUGMENT,3954,). Republished with articles No. 4, 21, and 23 in "Computer Supported Cooperative Work: A Book of Readings," Irene Greif [Ed. ], Morgan Kaufmann Publishers, Inc., San Mateo, CA, 1988, pp. 81-105. See also Engelbart's videotaped presentation from this historic 1968 conference "A Research Center for Augmenting Human Intellect." Augmenting Human Intellect: A Conceptual Framework. (Doug's seminal report documenting his strategic vision that drove the work) Douglas C. Engelbart, Summary Report, Stanford Research Institute, on Contract AF 49(638)-1024, October 1962, 134 pages (AUGMENT,133182,). Workstation History and The Augmented Knowledge Workshop. Douglas C. Engelbart, Proceedings of the ACM Conference on the History of Personal Workstations, Palo Alto, CA, January 9-10, 1986, pp. 73-83 (AUGMENT,101931,). Republished as The Augmented Knowledge Workshop in "A History of Personal Workstations," Adele Goldberg [Ed. ], ACM Press, New York, 1988, pp. 185-236. Doug's Bibliography - read about the innovative breakthroughs in his lab that led to the 1968 demo and beyond.